Delivery problems will mean some KFC outlets will remain closed for the rest of the week, while others will have a reduced menu or shortened hours. About half the fast food chain's 900 outlets in its UK-based division were still closed on Tuesday night. That was fewer than the 575 closed as of Monday evening. Last week the fried chicken chain switched its delivery contract to DHL, which has blamed "operational issues" for the supply disruption. Earlier, a KFC spokesperson expected the number of closures to fall in the coming coming days as teams "work flat-out all hours to clear the backlog". 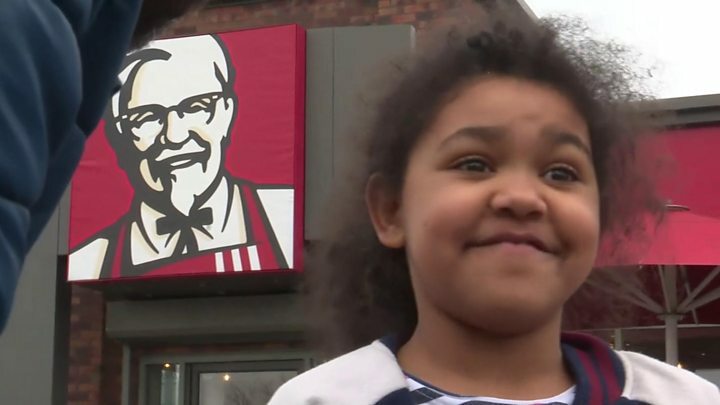 DHL's managing director of retail, John Boulter, said the delivery firm regretted the "interruption of supply" and apologised for the "inconvenience and disappointment caused to KFC and their customers". "The reasons for this unforeseen interruption of this complex service are being worked on with a goal to return to normal service levels as soon as possible," he added. KFC has set up a web page where customers can find their nearest outlet that is open. Until 13 February, KFC's chicken was delivered by specialist food distribution group Bidvest. But after the contract switched to DHL, many of the food giant's outlets began running out of chicken products. The GMB union said it had warned KFC that switching from Bidvest to DHL was a mistake. The change led to 255 job losses and the closure of a Bidvest depot, said Mick Rix, GMB national officer. "Bidvest are specialists - a food distribution firm with years of experience. DHL are scratching around for any work they can get, and undercut them," he said. A KFC spokesperson said the decision to change supplier had not been taken lightly. "DHL have estimated that winning the KFC contract and opening the new distribution centre has created 300 new jobs," he added. How much is it likely to cost KFC? 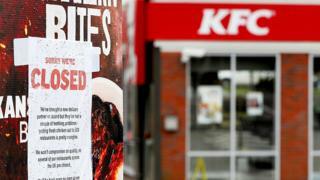 KFC's spokesman said he did not have a figure, but any calculation is likely to be complicated by the fact that 95% of KFC's outlets in the UK are run by franchisees. Some media reports say the crisis could be costing the chain £1m a day, but any such figure is likely to be guesswork. What's happening to KFC staff? Workers are being encouraged to take holiday, but would not be forced to do so, the company has said. A KFC worker in London who contacted the BBC said he had not received any shifts for the past week. "This problem isn't our fault, but we are the ones who can't work. "I have got bills that come out of my account on Friday and I feel terrible about the whole situation. I am looking for a new job," he said.